Handcrafted leather bobber seat with mounting kit for Harley Davidson Sportster. Available in black, tan and dark brown. Give your Harley Davidson Sportster the vintage look with our bobber seat conversion kit, handmade in England and designed for 2004+ Sportster models such as the Iron 883, Nightster, Iron 1200, 48, 72, Superlow and Roadster. 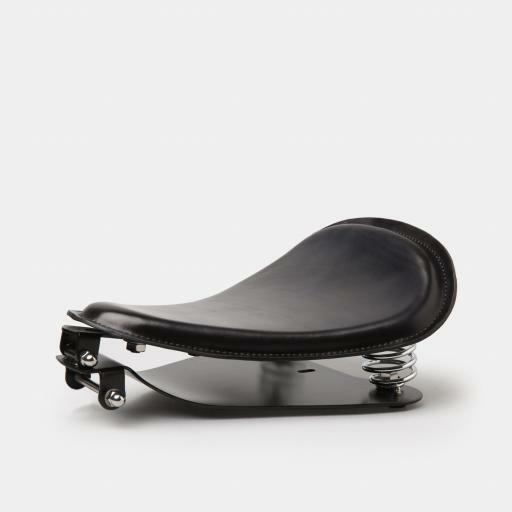 Each saddle is crafted from premium veg-tanned leather and stitched by hand, and the Sportster solo seat kit comes pre-assembled, complete with brackets, nuts and bolts. We only offer classic 2″ barrel springs for the bobber seat kit. We have seen other companies providing all sorts of options, such as 3″ and 5″, and even shock mounts. These are all far too tall for Sportsters, resulting in the seat being pitched forward which provides a less than ideal riding position. In our experience a 2″ height gives perfect rider position and overall aesthetics. For more information on compatibility with your Harley Sportster, see our FAQ page.